It is especially poignant today, as an immigrant in a country built by immigrants (who were all shunned as soon as they came in, except for slaves; slaves were welcome), unable to find connection and belonging, to finally force it through a surrogate object. I wasn’t building a house, I was building another body to contain my own, and at the same time, I was delineating a space for myself, carving out a habitat that would only be governed by my rules, form and function. It wasn’t as automatic as I had expected. I welded the frame, I bolted the axles to it, put up the frame, insulation, sheathing, roof, windows, tyvek, and it felt like a house. It was a separate and distinct space I had made, even if with my own hands, and yet I still didn’t feel a sense of ownership. This time, one year ago, I started building up the inside of the shell; the priority was the hearth. I thought it appropriate (most of the work I do starts from a play on words). It’s about the three Rs: relationships, rituals, and restrictions. While her talk is about defining belonging as to a larger domain like an ethnicity or a neighborhood, I thought her words could also apply to smaller spaces, like one’s own body or house (especially in the case of invalid bodies). The restrictions of a tiny house are evidently dimensional. Personal restrictions that relate to both ritual and relationship to the space are a different thing entirely. Asking guests to leave their shoes by the door, for example, is a personal restriction (which, of course, applies to the primary inhabitant first). There are also outward restrictions that are important because they create context: tiny houses are not recognized as permanent residences unless parked in a mobile home park. So legally, tiny house owners cannot reside where they wish in their homes without breaking the law. Hopefully, this law will change with the growing wave of tiny houses flooding the market place. 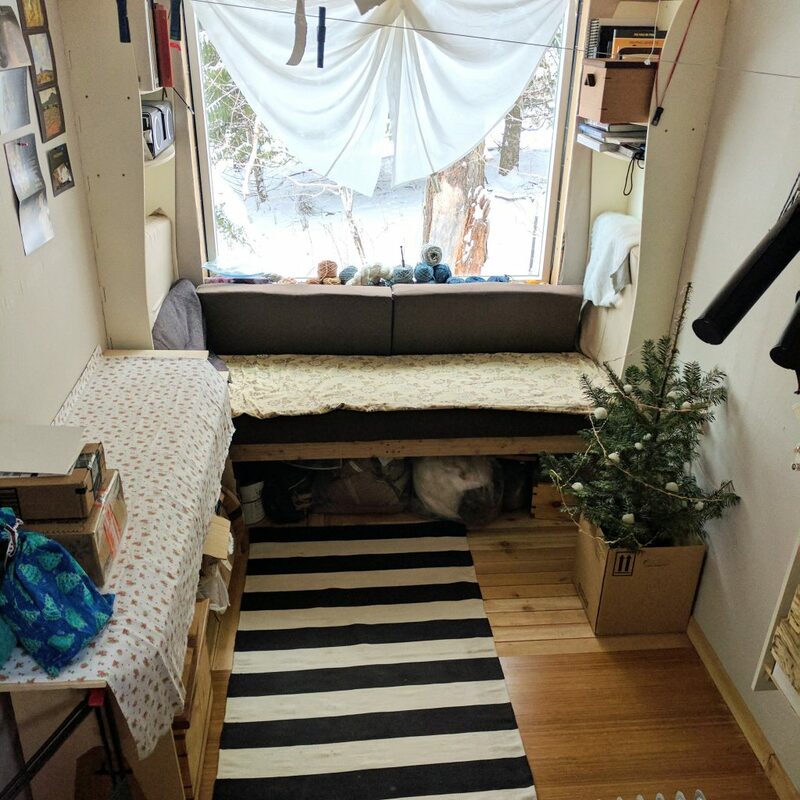 Within the limits of a small space, one can still find freedom in customizing the function of space according to one’s needs. I built my house in thirds, with one third as a fairly empty area designated as the studio (the only feature I insisted on having was an overlarge window with seating). I think of it as the moment when the dreamer opens her eyes wide and stares out into the world without seeing it; or seeing in between the visible and the invisible. A second third is the kitchen, with a curved counter-top and many shelves, the digestive system, where fresh water can be found still unplumbed. It is, as in many homes, the most used area, and the most filled with relationships and rituals involving the many objects (utensils, cookware, and crockery). If every relationship were a single line, the kitchen would be a crowded network. The third segment is made up of the den and bathroom downstairs, and the bedroom upstairs. I’m still unsure how the den functions because I think it takes on a different role almost every time I inhabit it, while the bedroom is a steady almost sacred space; it must be, because that is where I’m most vulnerable. Having fastened together the whole house with my own hands (much like a bird builds a nest), I feel that I can restructure it to my needs at any point, making it the most interactive space I’ve ever inhabited, thus denying some of its apparent physical limitations.